26% of all global websites are built on WordPress. That's a good deal of poetry! 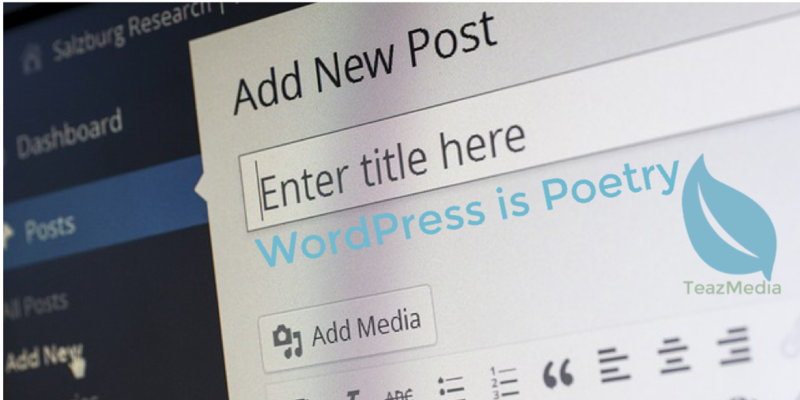 Generating over 22.3 billion pageviews per month, WordPress is a platform (CMS) that shouldn't be ignored when it's time to build your website. There are many solutions when it comes to creating a new website, but if your business is going to be around for a while, WordPress will stick by your side and scale up with you. Sure, you can save a few bucks by creating a basic webpage for your business or use a drag-and-drop solution like Squarespace or Weebly. However, I've seen too many businesses save a few bucks starting out and end up having to pay significantly more later due to the costs of maintaining a static site and adding new content to it. As a CMS (Content Management System), WordPress handles the details of page creation, navigation, SEO and blogging with a haiku simplicity. A designer or developer will be able to add content to your WordPress site with fewer costly billable hours than is often the case with medium to large static websites. Your business might be starting small, but soon many realize that more pages need to be added to their website along with other dynamic features. It's so much easier and less costly to do this if your site is already built on top of WordPress. A developer will be able to focus on the areas that really matter, like SEO, UX and strategy when adding those pages and features, than the time intensive details inherent with coding changes across multiple HTML static pages. This end result is a more robust, comprehensive solution that probably costs less in the long run. Can a non-techie person add content to a WordPress site? WordPress has an interface which works similar to other online posting sites with WYSIWYG editors. However, the real shine and poetry is achieved by WordPress developers who have the experience to deftly navigate the back-end text-editor, theme and plug-in world. It will likely be more costly to start with a WordPress site in the beginning, but you will find that the long term costs of working from a static (non-CMS or non-dynamic) site or drag-and-drop solution outweigh the initial costs of getting started with WordPress. WordPress is the right place to write your business story. I'm personally pretty passionate about WordPress and the supportive community that maintains this platform. Recently a client asked if their site would continue to grow with them. Every feature that was asked for, WordPress handled. It was nice to confidently answer that question with a decisive, yes. Sometimes you may encounter negative stories as with any platform, but it often boils down to buggy themes or plugins that someone installed with-out fully researching them. WordPress has a thriving, supportive community that will be around to help when hiccups happen. A good developer though will often avoid many of the hiccups in the first place. When hiring someone to build your WordPress site, try to get a feel for their experience and development philosophy. If they simply create a site based on a cookie-cutter theme without having a branding discussion or a design philosophy talk, you might not have found the right person. Unfortunately, there are some who will gladly take lots of money to simply roll out a WordPress site based on a cookie-cutter (one-size-fits-all) theme. It's not always easy to know what you will end up with, but listen carefully to the answers that they provide for your questions. Experienced developers and designers will try and guide you to approaches that are based on best industry practices which may not always jive with your own initial ideas. Trust the experience if it passes the sniff-test. Good developers are happy to discuss their experience and development approaches. They may sprinkle their conversations with tech-speak – things like grids, frameworks and information architecture – but it's only because we are passionate about the poetry we write. We love our haiku platform of choice! Contact TeazMedia today if you would like to start a conversation about your new website.